Salt spray testing is an accelerated corrosion test that produces a corrosive attack to coated samples in order to evaluate the suitability of the coating for use as a protective finish. We follow the American Society for Testing and Materials (ASTM) B117 standard. ASTM B117 Salt Fog and Salt Spray testing is relatively fast way to analyze the corrosion caused by salt water and chlorides on coated metals and alloys. The ASTM B117 standard for operating a salt fog or salt spray cabinet is a widely used corrosion test required by many companies and government agencies. The purpose of salt fog testing is to collect corrosion resistance data from either the Anodized or Chemfilm aluminum we process. Anodized aluminum is subjected to a salt fog environment for 336 hours then analyzed. Chemfilm aluminum is subjected to the salt fog for 168 hours then analyzed. 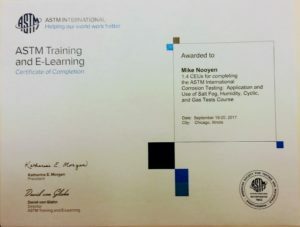 Our quality dept has been trained by the ASTM International in Chicago, IL. 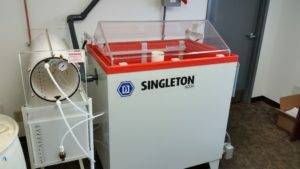 If you would like more information on Salt Spray test or set up a test, please call or email Mike N.